Characteristics: Moderate, well-proportioned, athletic dog. Loves to run, independent. Beautiful color and markings, dark eye, good bite, straight and flat coat with excellent texture. Beautifully chiseled headpiece. Good natured with other dogs. Extremely sweet and loving with people. Well-behaved and mannerly. Has sired several champions, Junior Hunters, and pointed field trial dogs. Characteristics: Good natured, well-behaved, self-confident. Balanced, well-boned, short-coupled, good rib spring. Long, elegant, well-arched neck, clean throat. Well-coated, markings on the dark side. Good tail set, can carry tail arched over back. Moves well in the ring and in the field. Good range, good nose, stylish point, strong desire for birds. 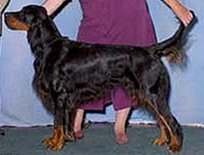 Has sired excellent birddogs and show competitors. A perfect gentleman's hunting companion. Very responsive and mannerly. Gorgeous classic point. Superb temperament. Strong and athletic. Great with children and puppies. Classic masculine Gordon headpiece, with no sign of houndiness. Has sired competitive field trial dogs and Junior Hunters.